Jared Sullinger (born March 4, 1992) is an American professional basketball player for the Toronto Raptors of the National Basketball Association (NBA). He played college basketball for Ohio State University before being drafted 21st overall by the Celtics in the 2012 NBA draft. Sullinger was rated as the number 2 player in the class of 2010 in the ESPNU 100 the number 4 player by Scout.com, and the number 5 player by Rivals.com. In his senior year, Sullinger led Northland High School to a 21-0 season and a #1 national ranking. He averaged 24.5 points and 11.7 rebounds for the season. Sullinger played in the 4th annual Boost Mobile Elite 24 Hoops Classic. Sullinger was selected to play in the 2010 McDonald's All-American Game in Columbus, Ohio, where he was named co-MVP with Harrison Barnes. He was also selected to play in the 2010 Nike Hoop Summit at the Rose Garden in Portland, Oregon and the 2010 Jordan Brand Classic at Madison Square Garden in New York. On March 10, 2010, Sullinger won the James A. Naismith Award, which goes to the boys basketball player of the year. Sullinger committed to Ohio State on May 10, 2007. Sullinger had 19 points and 14 rebounds in his Ohio State debut. Sullinger's brother, J.J. Sullinger also attended Ohio State and played for coach Thad Matta. For the 2010-2011 season Jared Sullinger averaged 17.2 points, 10.2 rebounds, and 1.2 assists in 31.7 minutes per game for the Buckeyes. Ohio State finished the regular season at 32-2 and was selected as the 2011 NCAA tournament's number one overall seed. The Buckeyes made it to the 'Sweet Sixteen' where they lost to Kentucky 62-60. Sullinger was named a First Team All-American by Fox Sports. In what would be his final year at Ohio State, Sullinger led the Buckeyes to a 31-8 overall record (13-5 Big Ten). Sullinger averaged 17.5 points and 9.3 rebounds per game during the 2011-12 season. The Buckeyes advanced to the 'Final Four' of the 2012 NCAA tournament, where the team lost to the Kansas Jayhawks. Sullinger had 13 points in the game and was 5-of-19 shooting with 11 rebounds in the loss. Five days after the loss, the two-time AP All-American declared he was entering the 2012 draft, where he was widely expected to be a lottery pick, until he was reportedly flagged by several teams after the Chicago pre-draft camp due to back issues. Sullinger going up for a dunk with Boston. On June 29, 2012, Sullinger was selected with the 21st overall pick in the 2012 NBA draft by the Boston Celtics. On July 3, he signed his rookie scale contract with the Celtics. On November 17, he recorded his first double-double with 12 points and 11 rebounds in a 107–89 win over the Toronto Raptors. The following night, he scored a season-high 16 points in a loss to the Detroit Pistons. He tied that mark on December 25, recording 16 points and 7 rebounds in a 93–76 win over the Brooklyn Nets. On February 1, 2013, Sullinger underwent successful lumbar disk surgery and was subsequently ruled out for the rest of the season. On January 15, 2014, in a win over the Toronto Raptors, Sullinger recorded 25 points and a career-high 20 rebounds. Sullinger's 20-20 was the first by a Celtics player since Kevin Garnett did so in 2007. On February 7, he scored a career-high 31 points in a 99–89 win over the Sacramento Kings. After averaging 14.4 points and 8.1 rebounds per game up until the 2015 NBA All-Star Weekend, Sullinger was ruled indefinite after X-rays on February 19 revealed a stress reaction in his left foot. Three days later, he was ruled out for the rest of the season after further medical evaluation determined that Sullinger had sustained a left metatarsal stress fracture. However, in a surprising move, Sullinger returned to action on April 3 against the Milwaukee Bucks. He entered the game four minutes into the third quarter, missed both his shots and didn't return as part of a gradual effort to improve his stamina. Sullinger began the 2015–16 season coming off the bench for the first three games. He started his first game of the season on November 4 against the Indiana Pacers, replacing Tyler Zeller as the starting center. On December 7, 2015, Sullinger scored 11 points and tied a career-high with 20 rebounds in a 111–93 win over the New Orleans Pelicans. On February 7, 2016, he tied his season-high with 21 points in a 128–119 win over the Sacramento Kings. On July 11, 2016, the Celtics renounced their qualifying offer on Sullinger, making him an unrestricted free agent. On July 14, 2016, Sullinger signed a one-year, $6 million contract with the Toronto Raptors. On October 24, 2016, it was announced that Sullinger would be ruled out for the start of the season with a foot injury that he had sustained during a preseason game against the Golden State Warriors. He's currently expected to be out for 2–3 months after foot surgery. On September 3, 2013, Sullinger turned himself in to police after an alleged domestic assault on his girlfriend. He was charged with assault and battery, intimidation of a witness, and destruction of property. He pleaded not guilty to the charges, which were later dropped. ↑ "College Basketball Recruiting - ESPNU 100 - ESPN". Insider.espn.go.com. Retrieved 2010-08-26. ↑ "Scout.com: Football Recruiting". Scouthoops.scout.com. Retrieved 2010-08-26. ↑ "Yahoo Sports: Rivals.com Ranking - Rivals150 for class of 2010". Rivalshoops.rivals.com. Retrieved 2010-08-26. 1 2 "Northland High School basketball player, father win national Naismith awards". The Columbus Dispatch. 2010-03-10. Retrieved 2010-08-26. ↑ "Boost Mobile Elite 24 Roster Announced". Slam Online. 2009-08-05. Retrieved 2010-08-26. ↑ "McDonald's All-American Game Team Announced". Slam Online. 2010-02-11. Retrieved 2010-08-26. ↑ "McDonald's All-American night: Knight's 3-pointer wins it for the West - MaxPreps News". Maxpreps.com. 2010-03-31. Retrieved 2010-08-26. ↑ "It's the USA Against Everyone Else". Slam Online. 2010-01-20. Retrieved 2010-08-26. ↑ "Jordan Brand All-American Game Team Announced". Slam Online. 2010-02-18. Retrieved 2010-08-26. ↑ "A Summer Full of Events for #1 Center in the Country, Jared Sullinger". Escoutroom.com. 2007-05-05. Retrieved 2010-08-26. ↑ Goodman, Jeff (Mar 7, 2011). "Goodman's 2010-11 All-America teams". Fox Sports. Fox Sports Interactive Media. Retrieved June 21, 2011. ↑ "Celtics Sign 2012 NBA Draft Picks". NBA.com. July 3, 2012. Retrieved December 9, 2014. 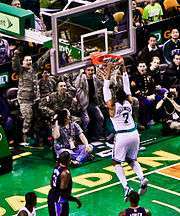 ↑ "Celtics' Sullinger out for season with back injury". NBA.com. February 1, 2013. Retrieved August 21, 2013. ↑ "Celtics top Raptors 88-83, end 9-game skid". ESPN.com. January 15, 2014. Retrieved January 15, 2014. ↑ "Raptors Sign Jared Sullinger". NBA.com. July 14, 2016. Retrieved July 14, 2016. ↑ "Jared Sullinger Inks One-Year, $6 Million Deal With Toronto". slamonline.com. July 11, 2016. Retrieved October 22, 2016. ↑ "Jared Sullinger's Injury Could Be A Big Problem For The Toronto Raptors". hoopshabit.com. October 26, 2016. Retrieved November 1, 2016. ↑ "Jared Sullinger's absence shouldn't be issue for Raptors". todaysfastbreak.com. October 26, 2016. Retrieved November 1, 2016. ↑ King, Jay (September 3, 2013). "Jared Sullinger arrested: Boston Celtics forward turned himself in after domestic incident, according to report". masslive.com. Retrieved September 3, 2013. ↑ "Celtics' Sullinger pleads not guilty to domestic assault". NBA.com. Turner Sports Interactive, Inc. September 3, 2013. Retrieved September 3, 2013.